Many herbs have known medical properties you will sure want to explore, and many herbs are very tasty so they can be used in numerous meals. However, that’s not all. There are many other ways in which you can use herbs so they are never a waste. Knowing how to use herbs in your home is very important, because most of the time, herbs are easy to grow so chances are that you will end up with a large quantity of herbs you might don’t know what to do with. Rosemary is a great herb you can use to get rid of mosquitos. It makes a fantastic mosquito deterrent. All you need to do is to grow rosemary in your garden, preferably near an area on your porch where you like to spend your evenings. This will keep mosquitoes away. Another great use of rosemary is to make a hair care product out of it. Rosemary can help with hair re-growth and strengthening, and it’s also great when it comes to elimination of dandruff. You can make a great hair care product by simply boiling a handful of rosemary leaves in two cups of water. Make sure to let the water cool. Rinse your hair with this mixture. Marjoram is a powerful herb that can be used to make a healthy, natural perfume. Did you know that, according to mythology, Aphrodite, the goddess of love, grew marjoram? For this reason, marjoram has been widely used as a love potion in the past. While we cannot guarantee the love potion power of this herb, it is proven that it works great as a natural perfume. Simply take fresh marjoram leaves and rub them behind your ears and on your wrists. You will be surprised by the results. Marjoram has a sweet and light aroma with a spicy edge so both men and women can use this wonderful natural perfume. Another great way to use this herb is to build your bones. Marjoram has 520% of the recommended daily intake of vitamin K. It makes it one of the richest herbal sources of this vitamin. As you probably know, vitamin K contributes to healthy bones and it prevents the onset of osteoporosis, so it’s clear marjoram can help you build stronger bones. Mint is probably the most popular herb of them all, and it’s often used for making a tasty tea. However, that’s not all. Mint is a great herb for making mojitos. You can make a tasty mojito with a kombucha base quickly and easily. Mint is truly a great herb, with or without alcohol! Another great way to use mint is to make an effective repellent against mice. Humans love the smell of fresh mint but mice hate them. They tend to avoid all areas where mint is scattered. This is who you can keep mice away in a simple and humane manner. Parsley is a popular herm you can use in many different ways. For example, you can make an effective remover of the dark circles under your eyes. This herb contains helpful elements such as vitamin C, chlorophyll, and vitamin K and many other active compounds. They can all be used to reduce inflammation, lighten and tighten the skin, which will make the dark circles less noticeable. Another great way to use parsley is as a breath freshener. To use parsley in this way, simply chew on parsley after dinner. This is particularly important if you ate garlic. Parsley is very effective in removing bad breath and it leaves a very fragrant and pleasant scent. Tarragon is a great herb to make a homemade toothache treatment. 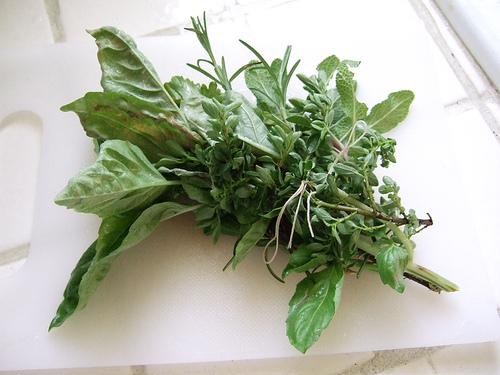 Did you know that Greeks used to chew on this herb to numb their mouths from toothache? You can use tarragon in the same way! Instead of taking a painkiller, try a natural painkiller. There is an added bonus – tarragon makes your breath super-fresh! Another way in which you can use tarragon is to clean yourself from the inside out. Eating tarragon is related to increased bile production, which in turn contributes to the elimination of toxins from the body. Tarragon is packed with useful elements, such as tannins, bitters terpenes, flavonoids and coumarin. All of these elements have powerful cleaning properties. Your body will thank you for this cleaning regime! Thyme is a great herb you can use for its medical properties and its cleaning properties. As a medical herb, thyme makes a great lung booster. It contains an oil called thymol. This oil acts as a powerful antiseptic and disinfectant. To clean your lung passageways and to prevent bronchitis, add a spring of thyme to hot water. You may also add some honey or lemon to the water to make a great soothing drink. Another great way to use thyme is to make it into a household cleaner. It has powerful disinfectant properties, so you can use it to clean your home. Thyme is a great alternative to harsh, toxic chemical cleaners. To make a household cleaner, simply brew some fresh thyme in water. Mix this water with a light, vegetable-based soap. Pour the mixture into a spray bottle and use it to clean bathroom and kitchen surfaces. Basil is a powerful herb that can help you treat adrenal fatigue. Simply place a few drops of basil oil on your clothing so its effects will stay with you all day long. You may also add some fresh basil to your meals to achieve the same effect. Basil is also great for treating acne. It has strong anti-inflammatory and anti-bacterial properties, so it can help you get rid of acne. 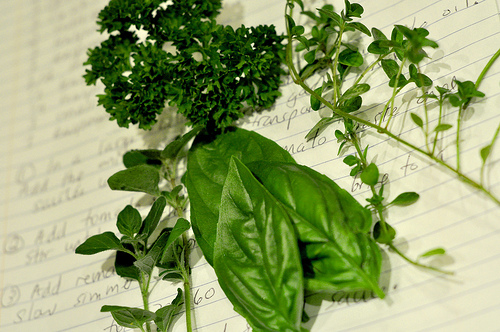 All you need to do is to steep fresh basil leaves in hot water for about 20 to 30 minutes. Let the water cool. Use a cotton ball to apply the basil-infused liquid to the areas affected by acne. Oregano is very tasty on your pizza, but it also makes a great common cold remedy. It can be used to relieve sinus pressure and it can be used for all kinds of colds. The most effective is oregano oil, which you can find in many health stores if you are unable to make your own. Simply place a few drops under your tongue or add 2-3 drops to your water or juice before drinking. The oil is known to drain sinuses and reduces inflammation, so it will make you feel better in no time. Another great use of oregano comes from its anti-microbial properties. It can help you fight E coli and other bacteria responsible for urinary tract infections. Again, oregano oil is the most powerful form of oregano you can use to fight urinary tract infections. Saffron can be used as a great memory booster. This herb contains a compound called “crocin”, which is known to contribute to faster learning and better memory retention. This is particularly helpful to older people with age-related mental impairments. Another great way to use saffron is as a colorant. You can color a grain dish red or even your fabric, this herb will add a dark rosy tint. Coriander can be used as a great treatment for headaches. This is a natural remedy so you don’t have to use chemical painkillers. Simply grind coriander leaves to release their juice. Rub this paste on your forehead to relieve the symptoms of headache. Another effective way to apply coriander remedy is to sleep with a coriander leaf on your pillow. Coriander can also be used to boost your immunity. The leaves of this herb contain high doses of magnesium, potassium, and fiber. You should add coriander to your diet to boost your immunity.